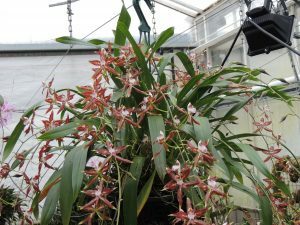 Today’s star orchid in the greenhouse has to be Odontoglossum cristatum with our mature plant presenting ten spikes in flower as well as more in bud still to come. Odontoglossum cristatum is native to Ecuador and Colombia where it is found in cloud forest from 1500-2600 m altitude and so it is very well suited to growing in our Cool Americas section. 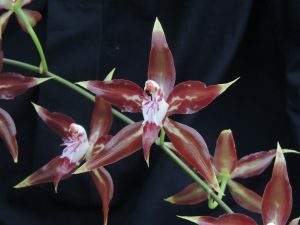 I have always known this plant as Odontoglossum cristatum but odontoglossum species have been included in Oncidium on the basis of molecular studies. Our plants go back to a seedling purchased in 1996 and since then we have grown the species in pots, mounted and in baskets. We find that the species particularly enjoys a basket where it produces masses of roots and can grow into a specimen. 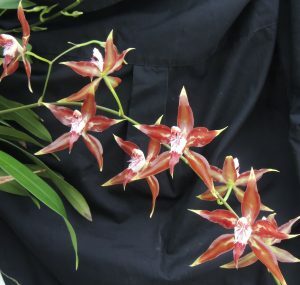 The plant photographed today began flowering in December and will still be in flower at the end of April. We have other plants have spikes ready to open in April and flower until June.We keep plants watered all year as they are always in growth.